By Louis Jacobson on Monday, September 25th, 2017 at 5:08 p.m.
During a White House press briefing, Press Secretary Sarah Huckabee-Sanders answered questions about President Donald Trump's statements where he called those who kneeled during the National Anthem "SOBs." It has been hard to ignore the mixing of sports and politics recently, as President Donald Trump -- both on the stump and on Twitter -- repeatedly expressed his disgust with athletes who take a knee during the pre-game rendition of the Star-Spangled Banner. Most NFL players, and some coaches and owners, reacted against Trump’s words by linking arms as the national anthem was played before games on Sept. 24 and 25, and the Pittsburgh Steelers, Seattle Seahawks and Tennessee Titans remained largely off-field for the anthem. The recent controversy over the national anthem began in 2016, when then-NFL quarterback Colin Kaepernick initially sat, and later switched to taking a knee, during the pre-game anthem to protest racial discrimination, especially at the hands of police. With increased interest in the national anthem and its role at sporting events, we decided to take a closer look at some of its history. How long has the Star-Spangled Banner been played at sporting events? While the Star-Spangled Banner only became the nation’s official anthem in 1931, the lyrics date back to 1814, the anthem was played sporadically in the 1800s, several experts said. The earliest rendition came at the opening of Union Grounds park in Brooklyn on May 15, 1862 , which was during the Civil War, said John Thorn, the historian for Major League Baseball. The first documented example from opening day occurred in Philadelphia on April 22, 1897. A key turning point came during the 1918 World Series between the Chicago Cubs and Boston Red Sox. That year’s World Series was held during World War I, and "the public mood was sullen and anxious," Luke Cyphers and Ethan Trex wrote in ESPN The Magazine in 2011. "The war strained the economy and the workforce, including baseball's. The government began drafting major leaguers for military service that summer and ordered baseball to end the regular season by Labor Day." The mood, however, perked up considerably when a brass band began playing the Star-Spangled Banner during the seventh-inning stretch of one game. "The crowd, already standing, showed its first real signs of life all day, joining in a spontaneous sing-along, haltingly at first, then finishing with flair," Cyphers and Trex wrote. "The scene made such an impression that the New York Times opened its recap of the game not with a description of the action on the field but with an account of the impromptu singing." The scene also made an impression on the two teams’ front offices. The Cubs’ management made sure the band played the anthem during the next two games as well, and attendance, which had been in a rut, increased. When the series moved to Boston’s Fenway Park, officials moved the playing of the anthem to the pregame festivities, coupled with the introduction of wounded soldiers who had received free tickets," the authors wrote. The anthem was played periodically in baseball after that, but it took until another war -- World War II -- before it was played before essentially every game. Playing the national anthem before regular season games "was not universal in baseball until 1942 and the start of World War II, though some clubs started the practice in 1941," said Michael Teevan, a spokesman for Major League Baseball. Since then, "the national anthem has been played before virtually every professional — and many collegiate and high school — baseball, football, basketball, hockey and soccer contests in this country," said Marc Leepson, author of Flag: An American Biography and What So Proudly We Hailed: Francis Scott Key, A Life. In the period after the 9/11 terrorist attacks, the anthem took on special meaning at sporting events, and some teams arranged pregame events with survivors and first responders. In some cases, a rendition of America the Beautiful was added, said Elliott J. Gorn, a Loyola University of Chicago historian and co-author of A Brief History of American Sports. Singing the national anthem before National Football League games has been ongoing for "decades," said NFL spokesman Brian McCarthy. One aspect of this history that has spawned some confusion in recent days concerns a change made in 2009. Until that year, players in primetime games would remain inside their locker rooms while the anthem was sung, due to timing concerns for the television networks. After 2009, the players in primetime games have been on the field during the anthem, McCarthy said. But this change only affected primetime games. For all other games -- typically held at 1 p.m. or 4 p.m. Eastern -- players had already been stationed on the field for the national anthem. So the 2009 change simply applied to primetime games the rules that had already been in place for daytime games. Part of the confusion, McCarthy said, may be that television networks often haven’t shown the national anthem being played. How common have anthem-related protests been? In 1968, U.S. Olympic athletes Tommie Smith and John Carlos gave a raised-fist "black power" salute on the medal stand as the Star-Spangled Banner was being played. They were thrown out of the Olympics. Four years later, U.S. Olympians Vince Matthews and Wayne Collett, who were also African-American, were barred from further competition when they were considered to have shown insufficient respect from the medal stand. Some fans also found room to express their views during the anthem. "During the Vietnam era, it was not uncommon for fans -- not enormous numbers, but some -- to remain seated during the anthem," Gorn said. In March 1996, the National Basketball Association suspended the Denver Nuggets’ Mahmoud Abdul-Rauf. A convert to Islam, Abdul-Rauf said he did not believe in standing for any nationalistic ideology, according to the New York Times. As for baseball, Cassidy Lent, a reference librarian at the National Baseball Hall of Fame and Museum in Cooperstown, N.Y., said she was not aware of any protests beyond the one by Bruce Maxwell of the Oakland A's in the wake of Trump’s comments. A footnote: In his 1972 autobiography, I Never Had It Made, Jackie Robinson -- who broke baseball’s color line in 1947 -- wrote, "As I write this twenty years later, I cannot stand and sing the anthem. I cannot salute the flag; I know that I am a black man in a white world." Is there an NFL rule against kneeling during the anthem? This notion gained attention on social media in the wake of Trump’s comments and the NFL’s reaction. 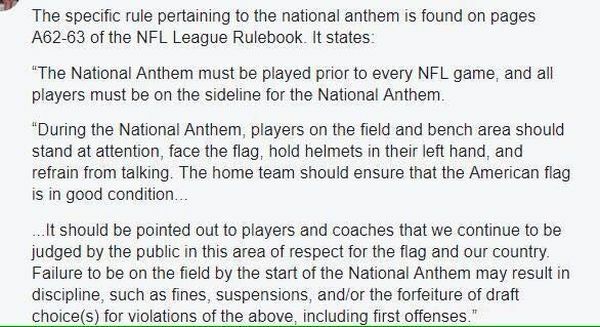 One version we came across said the anthem "must be played prior to every NFL game, and all players must be on the sideline for the National Anthem," standing, facing the flag, helmets in left hands. This language does not appear in the NFL Rule Book, as the post indicates. However, it is apparently included in a separate document called the "game operations manual." This document is not online, so we can’t review it first-hand, but McCarthy, the NFL spokesman, said it is distributed by the league to all of its member teams. While text circulating on social media would seem to suggest there will be consequences for protesting during the anthem, there is discretion involved -- and the NFL has repeatedly stated that it will not punish players for taking a knee during the anthem. McCarthy told PolitiFact that "players are strongly encouraged, but not required, to stand during the national anthem." He has used essentially the same language in previous statements going back to 2016. Another NFL spokesman, Joe Lockhart, said during a conference call with reporters on Sept. 25 that "there will be no discipline handed down this week." He added, "We also believe our players have a right to express themselves." 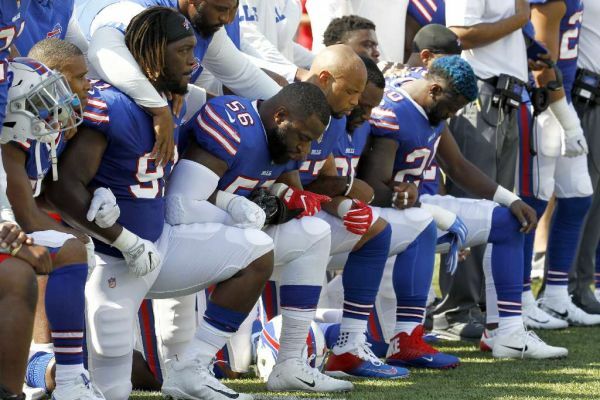 The national anthem "must be played prior to every NFL game, and all players must be on the sideline for the National Anthem," standing, facing the flag, helmets in left hands. CLARIFICATION, Sept. 27, 2017: This article has been updated to provide more specificity in describing the origin of Kaepernick’s protest. For three games beginning on Aug. 14, Kaepernick sat during the anthem. Then, after consulting former Green Beret and former NFL player Nate Boyer about the best way to make his point without disrespecting the military, Kaepernick began taking a knee in games beginning on Sept. 1.